After the Abolition of Slavery (Aug. 1, 1834) many planters saw an impending shortage of labour. Consequently new measures were sought in an effort to solve this problem. One measure sought was the establishment of a European settlement by Lord Seaford, then owner of Montpelier Estate and Shettlewood Pen which were located in St. James. Over one thousand (1000) Germans were brought to Jamaica with the promise of being granted house, land, and employment. 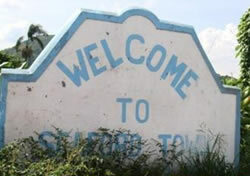 The township was established on five hundred acres of land in the parish of Westmoreland. Although a number of Germans migrated to North America some remained in Jamaica. Though the use of the German language has died, a few words have remained. Some buildings in Seaford Town have retained varying aspects of German architecture, and Catholicism has remained the dominant religion. Today, there are many members of the community with Caucasoid physical features and it is not uncommon to see a blond haired, blue eyed member of the community. There is a museum in the town displaying the history of the township.